A set of special folders are created for every Windows user automatically when Windows is installed. These folders have names like My Documents, My Pictures, My Videos or My Music, and are designed to provide you with a centralized location for specific file categories in the Windows operating system. These folders are not to be confused with the new libraries that Microsoft has integrated into Windows 7. They are all created on the same partition that Windows is installed on, something that some users might want to change. Probably the most common reason for doing so is storage limitations. If your main partition is small, you may want to move files and data to another drive because of that to avoid that its performance deteriorates, or that no new data can be stored in those locations anymore. The following articles explains how to move special folders like My Documents to another partition or location. This is actually easier than it sounds in Windows 7. Update: This method works in newer versions of Windows such as Windows 8 and Windows 10 as well. Microsoft dropped the "My" part of the folder name though, so that these folders are listed as Documents, Downloads, Favorites, Music, Pictures or Videos. All user accounts are created under the Users folder on the partition the operating system is installed on, usually c:\Users\. The special folders are located in the user folder, e.g. C:\Users\Martin\Music or C:\Users\Martin\Documents. One option to move those folders is to use symbolic links, a method that we have described in detail in a previous tutorial. But that is not the easiest option as Windows 7 offers an even better solution to moving the "My folders" to another location. Open Windows Explorer and navigate to the folder of the user whose My Documents folder you want to move to another location, e.g. C:\Users\Martin\. Locate the folder that you want to move to another location: we use the My Documents folder in this example but the same method applies to My Pictures, My Videos, My Music, Downloads and basically any other folder in the user directory that is created by default during user creation. Right-click the desired folder and select Properties from the menu. Switch in the new window to the location tab which should look like the following screenshot. The menu displays the current path of the folder and the three buttons Restore Default, Move and Find Target. Restore Default simply moves the files back to the default location of the folder. Move will open a browser with the option to pick a new folder where there files will be stored from then on. Find Target finally opens a Windows Explorer window with the folder's contents. The path to the new folder can also be pasted directly into the form if you select the move option. Selecting a new folder and clicking apply will open a Move Folder query that displays the old and new folder location and the option to move all files that are currently in the folder to the new location which is useful if you want the files to be available in the new location. If you don't do that, all existing files remain in the old location while all new files are created in the new location you picked instead. Note that you can only access the new location of the folder in Windows Explorer's sidebar. It is recommended to move the files if they need to be accessed by applications or services which is for instance the case for the save game folder or some of the other user folders. Just make sure that the new location has enough free storage space as you will run into copy operation errors when that is not the case. 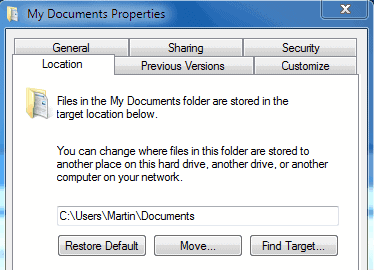 Windows 7 and newer versions of Windows make it dead easy to move the default data folders of a user account to another location. It is easier when you perform the operation right after installation of Windows or user account creation, but you can perform it any time later as well. How to move Windows special folders such as My Documents to another partition or drive in Windows. This isn’t exclusive of 7. I’ve been using this since the good old days of XP. SO HOW exactly have you been doing this since XP days Pejeno as XP does not have a ‘location’ tab in the file properties??? Maybe you were using TweakUI? Or hacking the registry? My Documents folder properties in XP does have a ‘Move’ button in the target area. I also have been “moving” My Documents folder in XP for about 6 years and told people in forums how to do it – primarily for separating disk images and file backups. The Properties “move” method retains ALL of the access points to the folder/files that My Documents had before, including the system “My Documents” icons. The folder is available in ALL the ways it was available prior to moving it, not just from windows sidebar as mentioned above “Note that you can ONLY access the new location of the folder in Windows Explorer’s sidebar”. Perhaps this is because you are are actually moving the folder itself, not just reassigning the files to a new folder. I like the idea of being able to name the folder something much shorter without extra path (\User\Owner\) as in D:DOCS, however, I like the idea that actually moving the folder itself retains every original access point to the folder. I also moved my email “store” folder in the same way so any C image restore wouldn’t affect it. @Art – I don’t see such a button on my WinXP SP3 install. I wonder why not? Maybe because I moved mine by hacking the registry? I don;t know why the move button would not be there, it is there on both my XP Home Edition w/SP3 on a Dell netbook, as well as on my XP Mode Virtual Windows XP Pro w/SP3 accessed from Windows 7 Ultimate. In years past I have also used TweakUI to move both Documents and Desktop if I recall. It describes and provide a link to a freeware application called Folder Redirector which it says makes it simple and fast to redirect folders to a different folder or drive. You can move My Music, My Pictures the same exact way, either before or after you move the My Documents folder. I have My Music and My Pictures sitting on their own, alongside My Documents. D:\My Documents, D:\My Music, D:\My Pictures. That way I can backup My Documents daily, but only need to backup the others when I have added something new (or changed/deleted something). Folder Redirector probably just coded what we are doing in a script. The only drawback of this method is that you can’t rename the folder to a shorter name (i.e. “My Documents” to “DOCS” – this article’s method CAN do this, but then access to the folder is restricted because only the FILES are redirected to a different folder, rather than the folder itself actually being redirected to a new location. I was able to also move Desktop, My Music, My Pictures, etc. Also my Email store (reassigned via Outlook Express. And all can be fully accessed as though they were still in the original places. If you right-click on the folder, somewhere in near the middle of the long list, you will see “Move to Folder”. You just navigate your system and pick a folder (or choose to create a new folder) on any drive/partition connected to your PC. I just checked it out on my XP computer. Be aware that this will NOT rename you folder, like you can do with the method in this article. The My Music folder will be stored IN the folder you choose/name. Mine are all stored on the root directory of my D:\ partition. ERROR CORRECTION: Above (different item) I said I assigned my email store the same way, but that was wrong (its been a LONG time…). I reassigned the storage for email via Outlook Express: Options, Maintenance, then the selection for Email Store allows you to reassign it’s location (to D:\Email Store) for me. Of course this was on XP..
Great info, but I’d really like to move a profiles “Application Data” but using the same method fails as the files are always in use. There’s no prompt to reboot or something and get it done during the next start-up. I know it can be done with Group Policies, but I’m not sure if that exists for Local policies only Domain ones. You can set up your backup program to copy some C configuration files/folders to your D drive, prior to backing up your D drive. I have some shortcuts set up to various C folder/files that I need to get at now and again. Saves a lot of time. I just found some info from Microsoft that says moving anything from the system area can prevent future upgrades to later versions of Windows. “Microsoft does not recommend that you change the location of the user profile directories or program data folders.” And goes on to say that if you do it in Win7, the Win8 will not install. This does not apply to folders like “My Documents” but to user profile or program data folders. Personally, I have no intention of ever upgrading to another Microsoft product. I’m moving to Linux after XP no longer meets my internet requirements (due to inability to update/upgrade software, such as Firefox, beyond a certain version). I’m already selecting Linux-compatible parts for the new desktop. The “move to folder” selection is available on ALL the folders on the C drive. I don’t know why C:\Documents and Settings wouldn’t work just the same as the My Documents folder. I have sub folders by month under a specific fold within My Documents. I have some July stuff that I want to move to August. With XP it was so easy using the Move selection and then typing in the specific folder (subfolder). How do you move folders or should i say subfolders around in Windows 7. BOY DO I WISH I HAD MY XP BACK, WHAT A WORKHORSE AND I JUST KNEW IT SO WELL. PLEASE REPLY. Sounds like you have what – Windows 7? I just bought a Lenovo laptop with Windows 7 and I just hate it. I have a retail copy of XP and I’m thinking of re-installing it on the laptop (I’ve made an image of the current C-drive, so if XP won’t work on it (Mobo drivers, etc.) I can restore Window 7. My ONLY problem with XP is that I can’t update various software (Firefox, Adobe, etc.) beyond a certain point, which affects internet access sometimes now. Microsoft has finally pushed me to Linux! My new desktop will be a Linux machine and the reason I bought this Lenovo laptop is so I can switch it to Linux too, once I get used to it. Can you help me? First I moved My documents to my second partition on my Hard Drive on my Win7.Since My videos and My Music did not go with the move, later I moved those as well to the second partition. Then I found that all my files have got mixed up; My video files have moved into my music folder and vice versa…the same with My documents.. I had thought that the files would remain in their own particular folders when I moved them. You advice will be very much appreciated. Thanking you in anticipation. Glad you figured it out – congratulations! It can get confusing when things don’t go as expected. You must have used the article’s method where the files were reassigned to a different folder. That can’t happen with the “move to folder” method because it moves the entire folder intact.